One of the biggest advantages of working at Holganix is that you have the opportunity to learn from hundreds of lawn care companies and take note of best practices in the industry. 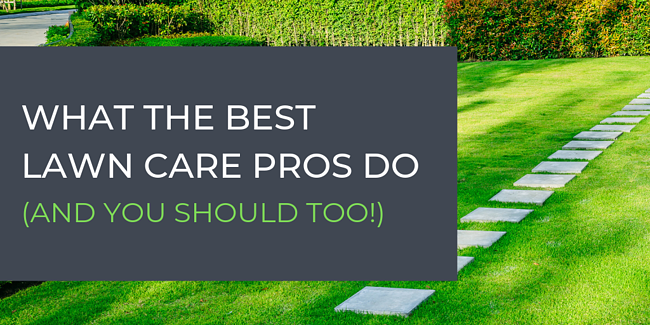 That's why we have curated 4.5 tips based on how some of the best lawn care pros run their businesses. If you have a suggestion for another tip that you see missing, be sure to include it in the comments of this blog. Often, as lawn care companies get busy they forget to calibrate their equipment. The risk of not calibrating is that you may use either too much or too little product, that also means the results you are providing for customers can be at risk. Start off the season right by calibrating your equipment and be sure to continue calibrating each week. Don’t know how to calibrate your equipment? Don’t sweat it, we have a blog and video that will walk you through equipment calibration step by step. Founding Father, Benjamin Franklin once stated, “A goal without a plan is just a wish.” If you want to grow your business this year, be sure to spend time planning out your marketing and sales strategy. But, also be okay with checking in on your goal, and adjusting it higher or lower as the year progresses. >>Looking for tips on growing your business, check out this blog and video from Holganix CEO & Founder, Barrett Ersek on his top tips for growing a lawn care company. Aside from planning your business growth, it is important to plan out your yearly fertilizer plan so you are organized on your rounds and have products in hand. Also, understand that Mother Nature throws curve balls and that your plan may need to be adjusted based on weather. We suggest proactively planning for weather problems by building a 1-to-2 week buffer between rounds, giving you ample time to catch up if you fall behind schedule. Looking for tips on planning your lawn fertilization program? Consider checking out Holganix’s Soil Smart Program which includes a recommended fertilizer program for your specific region. Inefficient routing can lead to reduced profits. Keeping routes tightly grouped together means your technicians spend more time servicing customers and less time driving from neighborhood-to-neighborhood, ultimately spending excess money on labor and fuel. Consider utilizing software like Real Green System’s Routing Assistant to maximize your routes. Also, consider ranking your neighborhoods so you and your team understand where your VIP customers live. When scheduling gets difficult, organize your routes so your VIP customers are serviced ahead of your B or C customers. >>Want to learn more about this customer ranking concept? Check out this blog on a process called Golden Street Approach. To make sure you are providing the best possible results for your homeowners, and doing so in a way that is efficient for your business and your piggy bank, stay abreast of new technology and trends in the industry. How do you stay in the loop on new technology and trends? Consider subscribing to an industry magazine, finding blogs (like this one!) that offers quality content, and attending trade shows and conferences. Also, consider stepping outside of our industry bubble and subscribing to magazines or newsletters like Fortune, Inc, and Entrepreneur to keep you in the loop on macro trends in the U.S. You never know when inspiration for your business will strike. Speaking of trends and new technology, here are some of the trends we are following. Soil Health - This is an increasingly big trend in the food and agriculture industry that we suspect will (and is!) trickling down to the landscape industry. Transparency - This is a trend affecting nearly all industries with thanks to the Millenial and Gen Z generations. Consider, how can you increase transparency at your lawn care company in order to best serve these new generations. Microbes - The food and agriculture industry is going crazy for microbes. Indigo Ag raised more than $650M to fund their business which has a focus on microbe technology, among other products. You can expect that harnessing microbes to care for turf will start to become big news. Check out this webinar for information on the results your company can expect by harness Holganix microbial product - Bio 800+ Lawn. When spring hits and the dandelions pop, your phone will be ringing off the hook with customers requesting extra service calls or just looking to complain. Understand that this too shall pass. If you have 300 customers, and 30 complaints, that means you have 270 happy customers! Don’t let the complaints drive you crazy, stay positive and do the very best you can. Want to Access Free Marketing Tools To Grow Your Business? New to the Holganix community? Or, just looking to add Holganix to your marketing strategy? Great! This marketing box is for you. he Holganix launch box includes content that helps you communicate why your lawn and landscape company is special for using Holganix.